This heterocyclic primary amine is derived form the decarboxylation of histidine. Histamine serves as a mediator of inflammation and hypersensitivity (anphylaxis) responses. Once sysnthesized by the histidine carboxylase enzyme, histamine is typically stored in metachromatic granules of basophils and mast cells (granulocytes) for later dispersion. Histamine is involved in a cascade physiological effects that are influenced by typical immune response and environmental factors. This assay, like many of our other assays, is developed for quantitative detection while providing both ease and convenience. 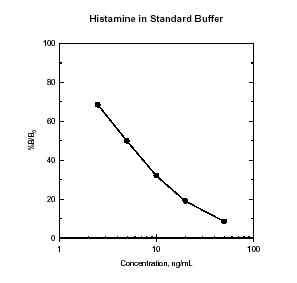 The histamine assay is a competitive ELISA that allows for competition between free histamine from the sample and HRP labeled histamine provided in the kit. A reaction with TMB substrate produces color development that is inversely proportional to the amount of histamine present. This color can be read at 650 nm or quenched in acid solution to read at 450 nm.